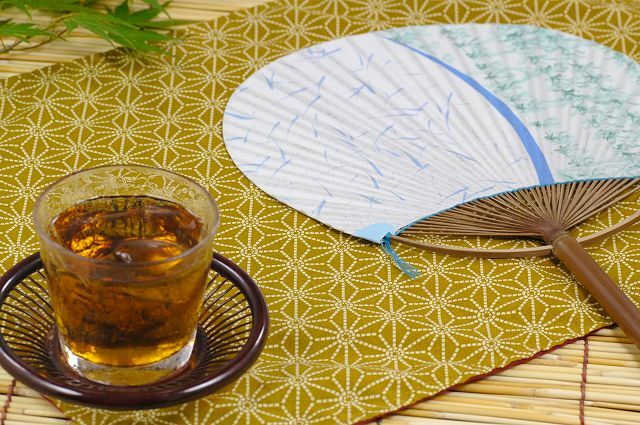 Summertime in Japan brings to mind a lot of different images and traditions, but one thing that will pop to almost anyone’s mind when they’re recalling their Japanese summers is a cold, refreshing glass of mugicha (麦茶). As a glass of lemonade is to America, a cup of mugicha is to Japan. Mugicha in English is “Barley tea” and is one of two Japanese teas that aren’t actually made from a tea plant (the other being kombucha (昆布茶), or kelp tea). Mugicha when served purely natural (as it usually is) is caffeine and sugar-free, as it’s made simply by steeping water with roasted barley oats. 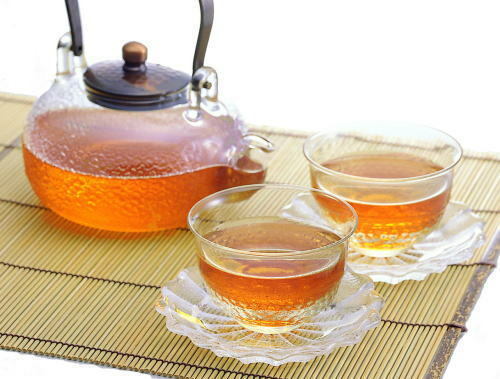 It has a nice toasty flavor; it also has slightly bitter undertones, but is milder than green teas. Because of how natural it is, it’s a great drink for anyone from a young child to people with health issues. Mugicha is also calorie-free, which makes it a great choice people who are dieting. While you can make your own mugicha at home by roasting barley in a pan then simmering the barley in some water for a while, there’s a much simpler way to get your mugicha fix. Even though it’s a drink that brings to mind summer, you can go into any Japanese grocery all throughout the year and find large packs of ground roasted barley tea bags. 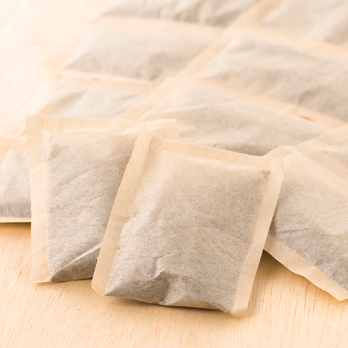 These packs contain anywhere from 10 to 50 teabags. Since 1 tea bag makes 1 liter of mugicha, a little can go a long way, so it will be easy for you to find a pack of mugicha to fit your needs. The other method is cold brewing. It’s much more convenient than the simmer method, especially in the heat of the summer when you don’t want to deal with the heat of the stove. It makes a slightly lighter (in color and in taste) mugicha, but it’s no less refreshing on a hot summer day. To cold brew mugicha, just put 1 bag into 1 liter of cold water and then put the pitcher into the fridge to chill and brew. Once your mugicha is all chilled through, you’re ready to drink it. You can even put it all together before going to bed then have mugicha all ready to enjoy the next day. If you’re just wanting to taste some mugicha before committing to a 50 bag pack or just don’t need a whole liter of mugicha hanging out in your fridge, no need to worry. Mugicha, like most Japanese teas, come ready-to-drink in bottles and cans. Just as flavorful and cooling as self-brewed mugicha with none of the wait! Now that the heat’s beginning to hit Texas, why not stop by Asahi Imports and grab a cold bottle of mugicha to enjoy on the go or a pack of mugicha that you can enjoy at home any time you want? Readers: what’s your favorite drink to beat the summer heat? Have any drinks that remind you of being in Japan or just really make you want to visit? Tell us all about them in the comments! I actually truly love Muchiga, but I’ve always sweetened mine with Agave and Honey (blame it on my sweet tooth, I suppose!). I’ve always assumed that this tea was sweetened because of the sweet taste from store-bought bottles. But now that I’ve learned that it’s originally enjoyed unsweetened, I shall try it that way as well. Thank you for this blog entry! Unsweetened mugicha is a great, refreshing drink; especially if you’re still having hot days like the ones in Texas right now. Unsweetened mugicha will have an earthier flavor if you’re used to sweetened, but it’s nice and light and sure to be refreshing.